This weekend marked the first Modern Grand Prix since the release of Guilds of Ravnica. Earlier this morning, 1,553 main event competitors arrived at the Cobb Galeria Centre in Atlanta with their best Modern decks. In the end, it was Peiyuan Zheng who emerged triumphant with Bant Spirits, defeating Piotr Głogowski and his Ironworks Combo deck in the finals. Modern, which takes its name from the "Modern" card frame redesign that happened nearly 15 years ago, is one of Magic's most popular formats. As demonstrated by the Day 2 metagame breakdown below, the format boasts a huge diversity of viable deck archetypes. The "other" category encompasses 25 singleton deck choices that we couldn't fit into the table: 8-Whack, BridgeVine, Bright to Light Scapeshift, Burning Spirits, Cheerios, Devoted Evolution, Domain Shadow, Faeries, Grixis Delver, Hollow One, Jeskai Aggro, Living End, Mardu Phoenix, Mono-White Martyr, Possibility Storm, Skred Red, Sultai Midrange, Temur Delver, Thopter-Sword, U/R Control, U/R Kiki-Jiki, Pyromancer Ascension, W/B Tokens, W/B Zombies, and W/U Spirits. Basically, there is a competitive deck for every style of player in Modern, and you never know what decks you might face in a Modern tournament. For a non-rotating format with nearly 15 years of cards, it's remarkable how big of an impact the last few sets have been. Focusing on Guilds of Ravnica, arguably the biggest addition was Creeping Chill, which revitalized the Dredge archetype. Draining up to 12 life over the course of the game provides reach, helps Bloodghast get active, and is hard to interact with. Although there were no Dredge decks in the Top 8, perhaps because players were prepared with plenty of graveyard hate in their sideboards, there were still three copies of the archetype in the Top 32. In honor of that performance, we bring you the following Twitch clip. Another Guilds of Ravnica card that made a big impact on Modern was Arclight Phoenix. Ideally, it is discarded to Faithless Looting on turn one and then brought back for free on turn two or three. Although no Arclight Phoenixes made the Top 8, there were six copies in the Top 32. Whereas Roope Metsa simply tossed two copies in his Mardu Pyromancer deck, Andrew Schneider was the best-performing player with 4 Arclight Phoenix in his main deck. His build, whose card choices are similar to the ones that Jon Stern explained to me for yesterday's highlights, focuses on discard effects, instants and sorcery spells, and creatures to take advantage of them. Only a little farther down in the final standings, we found the best-performing mono-red build, which uses even more Guilds of Ravnica cards: Runaway Steam-Kin and Risk Factor. In Quinn Kotecki's build, Runaway Steam-Kin powers the engine, and if it lives, you can do some pretty incredible things on the third turn. Given the rebate on red spells, you could chain a staggering amount of them and cast Bedlam Reveler very early. Although the best Arclight Phoenix deck surely hasn't been found yet, it adds a new angle to Modern that didn't exist previously, which is pretty exciting. Approximately 20 years ago, Sol Malka became famous for designing a black-green midrange deck featuring Phyrexian Plaguelord and Deranged Hermit. “I played it in Standard for a full year; it never came out of the sleeves," he told me. He named the deck after professional wrestler Dwayne Johnson, also known as The Rock. The deck name stuck, and it's the way Magic players have been referring to black-green midrange decks ever since. The reason behind the name, if you're curious, was that back then, his deck could make a whole lot of tokens with Deranged Hermit. "One of the Rock's catchphrases was ‘the millions and millions of Rock fans," Malka said. "So, the Hermit is the Rock, and the tokens are the millions." But that was nearly 20 years ago. Although Deranged Hermit is no longer legal, G/B midrange decks are still around in Modern, and they recently got a big boost in Assassin's Trophy. "It gives outs to resolved planeswalkers, which is huge. And it gives more game against Tron," Malka told me. And fittingly, the grandfather of the archetype heralded the introduction of Assassin's Trophy at the first Modern Grand Prix since its printing with an impressive 8-0 start. The sweet new Modern brews don't stop at Creeping Chill, Arclight Phoenix, and Assassin's Trophy. On Sunday mornings at GPs, coverage always starts with the segment known as Good Morning Magic. This segment showcases some of the wackiest, spiciest, and weirdest brews to make it through to Day 2. Let's take a closer look at five decks from that segment, many of whom had great performances. The main game plan of this deck, like a regular Devoted Company deck, is to assemble the infinite mana combo of Vizier of Remedies plus Devoted Druid, followed by Duskwatch Recruiter and Walking Ballista for the win. But the unique elements are the inclusion of Eldritch Evolution and Postmortem Lunge. Gold pro Thoralf Severin got the deck from his teammate Jasper Grimmer, who recently cashed with it at Grand Prix Stockholm and felt it was really strong. "He said the deck only got better because a lot of the metagame evolved to be faster, when Dredge got Creeping Chill and other decks had to win at the same pace," Severin told me. "All the card choices in the deck [including Eldritch Evolution] are made based on how fast you can kill. If there's no interaction, then we'll kill on turn 3 or maybe turn 3.2 on average. That's about as fast as you can go." "Especially the Postmortem Lunge is so surprising for many people—everybody read it so far," he laughed. What the card offers to the deck is resilience: when you play Devoted Druid on turn 2, you can still kill with it on turn 3 even if it dies. And that's pretty sweet. Steven Peets, playing in his first Grand Prix, had been playing Naya quite a while. "I wanted to play a midrange deck, so I was looking through the format in the moment they unbanned Wild Nacatl in Modern, and I was like 'I'm in'. And I've been in since then. There are some games where you stick two Wild Nacatls and turn them sideways and you just win." The key new addition from Guilds of Ravnica is the flexible Knight of Autumn, which comes close to a Kitchen Finks / Reclamation Sage / Loxodon Smiter split card. "With the addition of Knight of Autumn, the deck takes a different turn," Peets told me. As he explained, it adds some maindeck interaction against Tron or Affinity, gets him back into the game against Burn, or just turns into a 4/3 beater against control. They also yielded a surprising win against a Storm player yesterday: "He stormed out and had one card left in hand. He Grapeshotted me for 21—I was at 18—and I cast Collected Company, slammed two Knights, and gained eight. I don't think he was expecting that." He felt that Knight of Autumn drastically improved his Humans matchup. "It allows me to play the pivotal turn-2 three-drop. Especially if they start on Æther Vial, I can blow it up." He also made other card choices (such as Stirring Wildwood over Horizon Canopy, to block Mantis Rider all day long) with that matchup in mind, which is really valuable given that Humans was the most popular deck in Day 2. The main game plan of this deck is to stick Possibility Storm, cast Endless One, and turn it into an Emrakul, the Aeons Torn. "I've been playing the deck for like five years," Hauser told me, although this was his first time playing in a Grand Prix main event. "I played it since we had to play Memnite. When Battle for Zendikar came out, they printed Endless One. Endless One means that you can play—because Memnite is an artifact creature obviously—noncreature artifacts, which made a Blue Moon control shell much more possible. So I could play Vedalken Shackles, Batterskull, and Engineered Explosives. And then they banned Splinter Twin, so now my deck is pretty viable." If they ditch the Endless One, which is correct according to Hauser, there is a Zoetic Cavern in the deck, which both Expedition Map and Tolaria West can get. So then you morph Zoetic Cavern, and hit Emrakul guaranteed. As confirmed with the head judge, this interaction indeed works this way: even though Zoetic Cavern would be exiled face-up, Possibility Storm looks for the card type on the stack, where it was a creature. His list also had a lot of other one-ofs for Gifts Ungiven. "Modern is so diverse that hedging is net neutral, and with Gifts it's net positive." His deck has several sweet Gifts piles available. For instance, Hauser showed me Batterskull + Jace, the Mind Sculptor + Possibility Storm + Gifts Ungiven, which guarantees a way to win the game: either you get Batterskull or Jace, or you get the combo. His sideboard is filled with ways to beat otherwise difficult matchups: Leyline of Sanctity against Burn; graveyard hate (all of which are artifacts for Academy Ruins) against Dredge, and Gigadrowse to beat W/U Control. 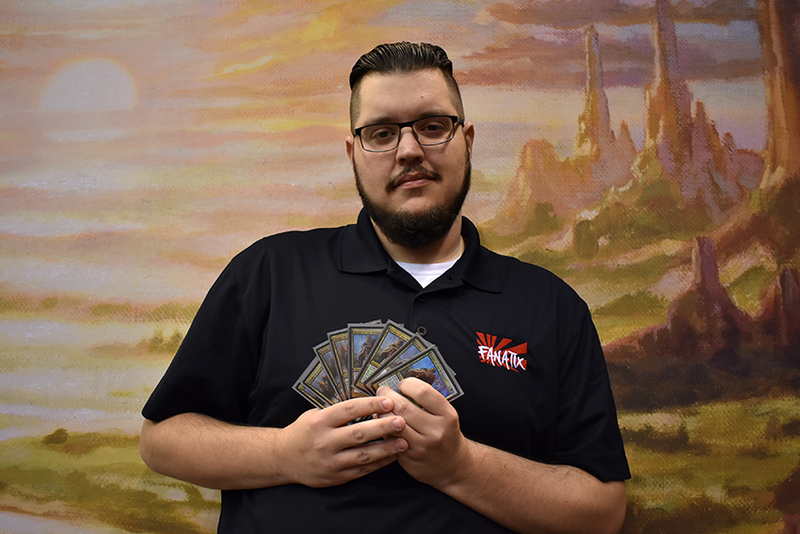 "It's kinda like a combo-control deck, a little bit like Splinter Twin," Pro Tour Amonkhet Top 8 competitor Marc Tobiasch told me. "You have Remand, Lightning Bolt, Path to Exile, Cryptic Command, Snapcaster Mage—that controlling package. And a lot of cantrips for consistency. Once you draw a Pyromancer Ascension, it's pretty easy to turn it on because everything replaces itself." With an active Pyromancer Ascension on the battlefield along with two Manamorphose and two Noxious Revival, the deck can go infinite: "The basic loop is that you play Manamorphose, which draws you two cards and makes four mana, and a Noxious Revival, which costs one mana to put a Manamorphose and another Noxious Revival back on top. You then draw the two cards you put on top, and since you've spent three mana to make four mana, that's an infinite loop. So you can make infinite mana of any color. The kill is that you swap out a Manamorphose in the loop with a Thought Scour or Lightning Bolt." Tobiasch had been playing this combo-control deck for a while—he originally built it for Pro Tour Philadelphia, the very first Modern Pro Tour in 2011—but it has changed a decent amount since then. Recently, he added Ral, Izzet Viceroy, and he was happy with that Guilds of Ravnica card. "The deck draws a lot of cards, but the cantrip chains always end in a land. I wanted another card that can win on its own. Ral is pretty strong, and it works well with the deck in general. It just ultimates in three turns, so sometimes when you don't find an Ascension or get disrupted, you just slam Ral, go Cryptic, Cryptic, Snap-Cryptic, and the ultimate always wins." Back in 2008, Japan's Yuta Takahashi won a Standard Grand Prix and a Block Constructed Grand Prix with Faeries. He has loved the tribe ever since, and this weekend he was once again trying to complete the trifecta of GP wins with Faeries in Block, Standard, and Modern. He came close to at least reaching the Top 8, but he lost his Round 15 win-and-in. A valiant effort nevertheless. I asked the Faeries master how he felt the deck was positioned in the current Modern format, and why he was only playing two copies of Spellstutter Sprite. As he told me, his deck has a very good matchup against W/U Control, but he needed to make some card choices with the Humans matchup in mind: “In Modern, Counterspell is not good because Humans plays Cavern of Souls and Æther Vial." That's why there were only two Spellstutter Sprite. And if there's anyone in the world whose opinion I trust on Bitterblossom decks, it's Yuta Takahashi. Make it two in a row for Bant Spirits. The deck has taken off in recent months, and no one played it better this weekend than Peiyuan Zheng, who fought his way through a stacked Top 8 lineup and persevered through some tight spots. Nothing came easy today for Zheng, but his determined performance–and some timely Spell Quellers–helped him see his way through a field of diverse matchups. In the Top 8 alone, he knocked off Yoshihiko Ikawa's Tron in the quarterfinals before running into the Hardened Scaled buzzsaw that had been European pro Christoffer Larsen. It took a game-three victory by the narrowest of margins to make the finals, but Zheng was up to the challenge. Once there, he took out Piotr Głogowski's Krark-Clan Ironworks combo deck in consecutive games to earn the trophy and cement his place at the top of the Modern metagame, for this weekend at least. 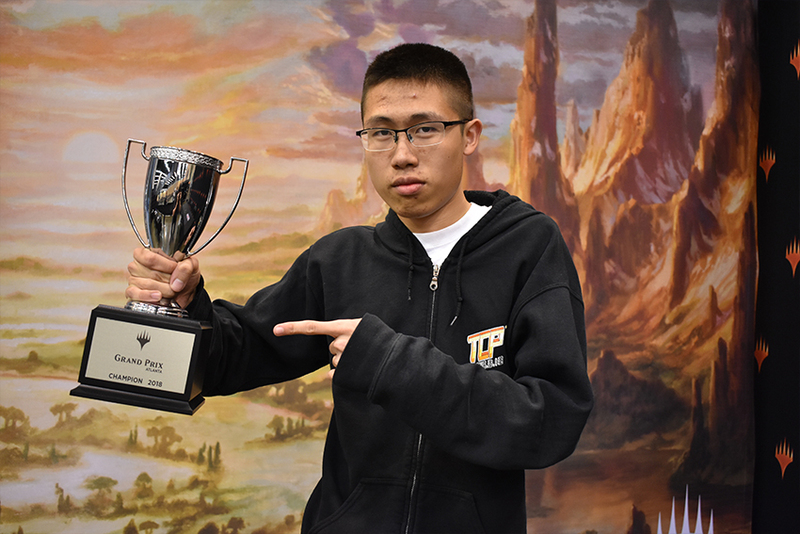 Congratulations to Peiyuan Zheng, your Grand Prix Atlanta 2018 champion!